If you are in debt, you might be wondering how to pay off your debt quickly. Maybe diligently paying your balances isn’t working and you’re getting tired of sending your hand earned money to the credit card or loan companies. Trust me; you aren’t alone. So, to get your motivation pumping for paying it off faster, here are 15 ideas below. 1. Call your credit card company and ask them to lower your interest rate. Make sure that you have paid several months on time in a row and have a good track record. That makes you more likely to get the rate you want. 2. Always pay above the minimum. Preferably, pay $100-$200 above the minimum to really put a dent in your debt. Pay even more if you can. 3. Start a side hustle and apply all extra income to your debt. 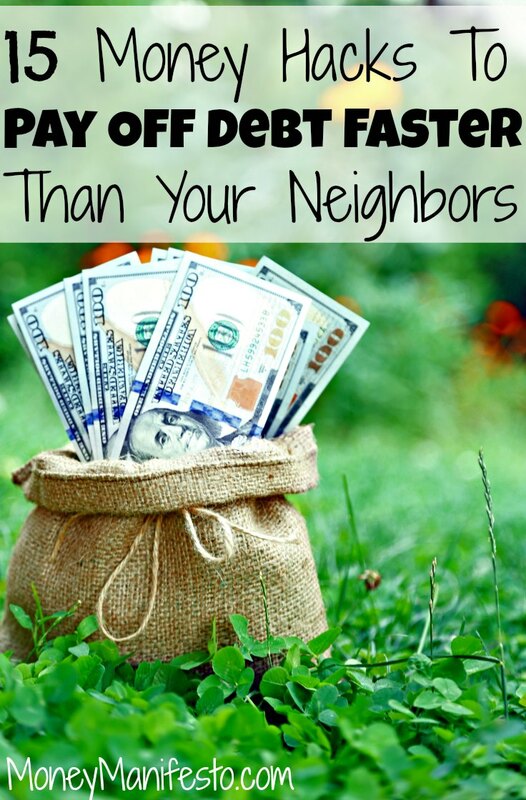 You can cut the neighbor’s grass, babysit your friend’s kid, walk your brother’s dog, or make some homemade meals and sell them to college students. Whatever you choose and whatever you do, work harder than you’ve ever worked in your life to make as much extra money as possible. 4. Tell others about your situation to get encouragement. Your parents, your significant other, and all of your friends should know about your debt so they don’t place you in tempting spending situations. 5. Unsubscribe to all “deal” e-mails. You don’t need to worry about that 20% off coupon to your favorite store in the mall. It will be there after your debt is paid off. 6. Consolidate your debt to one low interest rate. If this isn’t possible, try to put all of your energy and focus towards paying off the card with the highest interest rate, not the highest balance. 7. Apply to a peer-lending site for a debt consolidation loan. Some of those loans will get you better interest rates than your credit cards or private loans. 8. Stop spending on the cards completely and move to a cash only budget. It’s going to be painful at first but very worth it in the end. 9. Sell excess clothing and home décor and apply the cash to your debt. 10. Cancel your cable. Go ahead; you can do it! 11. Have a meeting with your boss to discuss your progress and future with your company. Make a professional proposal of reasons you should get a raise or, if you don’t think you will get one, discuss what you need to do over the next few months to secure one. 12. Try to have 2-3 vegetarian meals a week. Meat is often the most expensive part of a meal. 13. Switch to the drug store brand of makeup. I’m on this mission right now, and it’s really hard to tell a difference for me. 14. Start cleaning with vinegar and water instead of expensive household cleaners. 15. Count up your debt and put the number on a massive piece of paper on your wall so you can’t miss it. Ultimately, with just a few simple tweaks, you can start paying off your debt much faster. There’s no greater feeling in the world than being debt free, and if you can get there faster, it’s all the better! What are some other ways that people can kick their debt to the curb? I think #8 is the most important tip. It’s always important when solving a problem to first “stop the bleeding” before you focus and getting out of the hole that’s been dug. Great tips Lance! It’s definitely one of the more important ones. Cat actually wrote up this list, but I’m sure she’ll see this, too! Great stuff here, Cat! Paying more than the minimum seems to be the real winner here. Those minimum payments can totally make the debt drag on for years. Yuck! Good list. Drastically lower your expenses and seek more income. Once debt is paid off, examine the reason for the debt in the first place. Learn to save for things before buying them. This includes large items like vacations and automobiles. Great ideas! I especially like #3 (start a side hustle). Everyone has a skill that they can apply to make some extra cash along the way. Sometimes the demand is seasonal, so timing is everything. If it’s a unique or more specialized skill, you can charge a higher fee too. People talk about it as a means for investment, but it stands to reason that if people are lending then other people must be borrowing. Will give these sites a deeper look. Great tips! I totally did #15 when I was paying off my debt. It SUCKED to see that number on my wall every day and completely motivated me to keep paying it off. That’s so cool! I love visual reminders so it really works for me! I’m deleting the “deal” emails and I’m not even in debt, it’s just too tempting. One of my goals this year is to start making my own cleansers and detergents. I know it’s not hard, it’s just a matter of DOING it. The deal emails are total killer! I’ve had to go through several phases of deleting them. Great post, Cat! I’m happy to say we report that we don’t have any debt but we still use some of these strategies to boost our savings rate. Thanks Holly! You two are doing awesome for sure! Great tips! I think saving more money everyday and paying way more than the minimum are the best ways a person can do to pay off his or her debt. I already cut off my cable subscription, and about buying some meat I reviewed that my grocery bills were higher because I bought meat kilos. I will try to eat more vegetables and lessen eating the meat. I’m trying to do the same thing Clarisse!